001. For daytime makeup, I'll probably go for quite a natural eye and a simple red lip like in this photograph. My Rimmel Kate Matte lipstick in 107 (which is apparently called 'Wine' now, who knew!) is still my favourite red. 003. Just because we're single, doesn't mean we can't wear nice underwear. This pin made me swoon, so I headed straight to ASOS for my pretty (and comfortable, by the way) triangle bra fix. Their own brand lingerie ranges are so beautiful. 004. Despite my sister, Hanna, being the ultimate nail art pro, I've never really got the hang of it, and I'm not certain it suits me, either. While we've all seen/tried those classic heart tipped nails, I think they're a bit 'out there' for me; I'll probably opt for something like this more minimal Valentine's nail art instead (and I'll be nabbing Hanna's Essie Bahama Mama while I'm at it). 005. 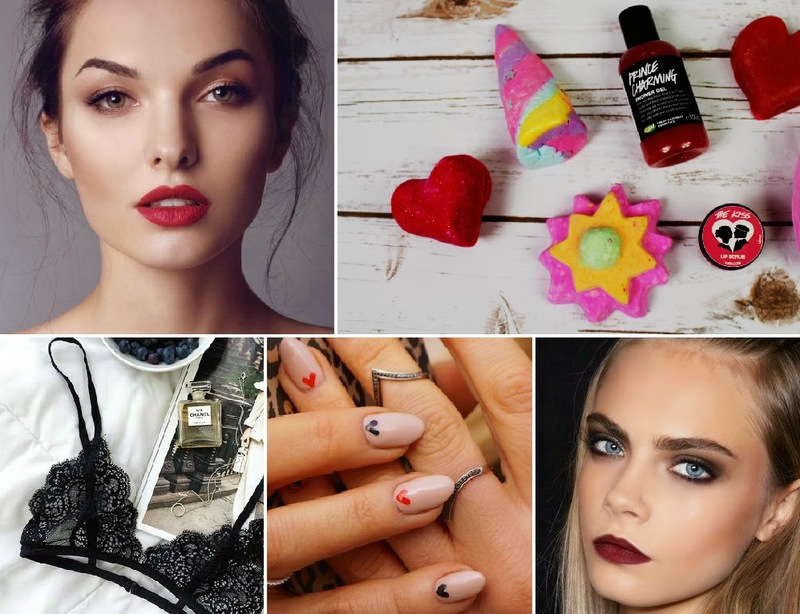 For going out, I'll be making like Cara in this pin and opting for a dark lip (hello my go-to MAC Dark Side lipstick + MAC Nightmoth lip pencil combo) and a sultry (hah) smokey eye. As for my actual plans... I'm going to be doing a very deliberate 'not-Valentine's' with my friends (and by that I mean what we do every weekend: go out, have a drink, have a dance, eat 'lunch' at 4pm the next day and then collapse in a heap for the entire evening with a film) to make it a bit more bearable. As it's my friend Jack's last weekend in England before he abandons me jets off to go adventuring in Cambodia, I might force Valentine's themed drinks on everyone or something because I think I'm hilarious. And you? (In case you happened to notice my lack of blogging for the past few weeks, it's been quite a rough month. I decided not to go into that in this post, or bother apologising, but you can read my Time To Change #Take5ToBlog post here).